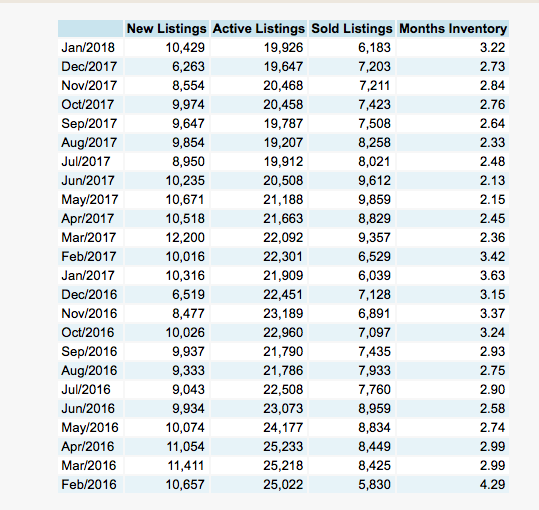 Yep, the overall inventory levels are still incredibly low and it's causing Realtors to have to look to other sources of property for droves of hungry buyers AND unassuming sellers are being taken advantage of by investors and real estate investment companies that are trying to stock up on inventory before our actual busy season (April through June) hits. HINT: If the deal seems to good to be true from one of these investors or real estate companies that "buy for cash and close when you want" then it probably is or there's a reason behind it that you aren't aware of...like your home is worth WAY more than you think. Keep in mind that we have four "markets" here in the Phoenix area....the under $200k market, the $200-$500k market, the $500k to $1M and then above $1M. Supply and demand is different in all four of these markets. Sales under $200k were 33% of sales in our area in 2017 so keep in mind that has a large impact on the overall average. Ask your trusted real estate advisor what the stats are for your particular area and price range so you remain competitive prior to listing your home for sale. Now let's talk mortgage interest rates. Yep, they've gone up. This past week the 10-year Treasury note hit the highest level in three years which basically means higher mortgage rates. They are currently over 4%. Keep in mind that from 2003 to 2011 the rates averaged between 5-6% and we have basically been spoiled since then. Typically rates are lowered to spark the housing market and, based on the info above, we can see that it worked 😊 The good news is it's still very affordable to purchase a home and live here in AZ as compared to many other areas that are this desirable to live. Posted on February 3, 2018 by Katie Lambert and filed under Real Estate News and tagged PhoenixMarket Phoenix real estate phoenixaz mortgage rates Katie Halle Lambert Team Evolution Real Estate Home for sale in Phoenix Phoenix Homes for sale.